Yeah…so, a few things happened in the past week that are kind of a big deal. Maybe even as big of a deal as Ron Burgundy. Thing 1: My last hope to get into MFA programs was shot. Being waitlisted turned into being rejected. Thing 1 in and of itself was disappointing, but helped me get to Thing 3. Thing 2: This idea had actually been brewing for awhile, but I’ll get to that in a sec. Thing 2 is that I resigned from my job for next year. I’ll finish off the year, naturally, but after that, I’m looking at non-gainful unemployment. Thing 3: I started planning a trip. A long one. One wherein I probably won’t be home for Christmas (for the first time in my life). I’ll probably see a real winter somewhere. And spring. And fall. Generally speaking, I will no longer be a stranger to the seasons! I will most likely be spending most of my time in Eastern and Western Europe, since that’s where a) I know the most people whose couches I can crash on and b) I can complete some writing projects centered around and in those areas. But mostly a), since I really miss my Euro friends, you know who you are. I will likely be in Greece for a lot of the summer, both because my honey will be working there, and also because of the writing project thing. I am also possibly going to walk some of St. James Way to Compostela. If not this year, then hopefully another. I will be WWOOFing. Definitely in Italy for a lot of it, but not only. I want to help with the olive harvest. 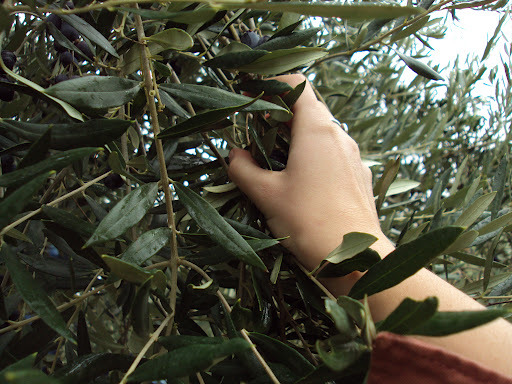 Yes, that’s my hand harvesting some olives in 2009 for approximately 30 minutes. I might be dreamin’ big here, but I think I can help for a little longer than that this time around! You may be wondering what the heck inspired me to make this choice. Well, once in awhile I find myself wondering about that, too, and then I think about a conversation that took place a few weeks ago during a very frustrating tennis match. My fella and I were playing tennis. We were talking about my future plans, and how horrid the feeling of waiting is (at this point I had not been rejected from the waitlist). How the idea to travel arose I don’t specifically recall anymore, but more than the words, I remember how I felt about it. The idea of taking time off to go where I wanted and be inspired to write was a lot more appealing than what I would be doing otherwise next year. I even began to think it would be better than getting into grad school, but mostly pushed that thought from my mind, lest the universe get the wrong idea. But then I heard myself reacting to this idea. Have you ever had one of those out-of-body experiences? The kind where people say they felt themselves float above their bodies and see everything in the room? I guess that’s a near-death experience. In any case, I haven’t actually had one of those, but I think this is the closest thing to it: a moment of true perspective. I heard myself, a healthy 25-year-old with enough savings, making excuses as to why international travel would be a bad idea. Looking back on it now, the biggest thing holding me back was fear. Suffice to say, my tennis game was pretty crap that day (he always beats me anyway, but still). The more frustrated I got trying to defend my mostly indefensible position, the worse I served, the fewer returns I made. But, I think it was the most productive game of tennis I’ve ever played. That moment of perspective, where I took a step back and heard myself sounding so fearful of how risky it would be to pick up and travel made me kind of sad. I’m not that person, and I already know that this decision will not be one I’ll regret. Ever. Yes, I am completely terrified. This is the first time in my life where I don’t have a precise idea as to where I’ll be and when. But I do know that I’m going to make it the best experience possible, and you all are invited along for the ride! I still have a lot of logistical planning to do, plane tickets to buy, new luggage to research, and probably am in the market for a sturdy but light (and preferably cheap) laptop. Recommendations for sites, gear, gadgets, etc. are all welcome! Or, as my 7th graders say, “yolo.” You Only Live Once. Your 7th graders quote Drake? How cute. Also, I completely approve of this decision! You go, lady! This will be an amazing experience. We'll miss you like crazy, but we'll be here waiting for you when you come back home! You are awesome! Can't wait to hear about your WWOOFing experience! Thanks so much, guys! And Jenny, I TOTALLY AM COMING TO SIENA.